Note All the below-mentioned apps work just as fine on both Android and iOS platforms. The mere mention of Photoshop Fix evokes the name of the PC giant, Photoshop. Adobe never really brought out its mobile variant, but instead introduced Photoshop Fix which is endowed with some splendid features that provide photographers with plenty of power and flexibility at their fingertips. The USP of this app, is well — doing quick fixes such as subtle adjustments to highlights and shadows, healing blemishes or slathering colour selectively via finger painting. Moreover, Photoshop Fix can smartly change background, detect facial features and lets you edit them through its Liquify tool. Not to mention, you can tweak facial features too. Take Photoshop Fix for a spin and you can instantly give yourself an action-hero jawline or massive hulk-like biceps. 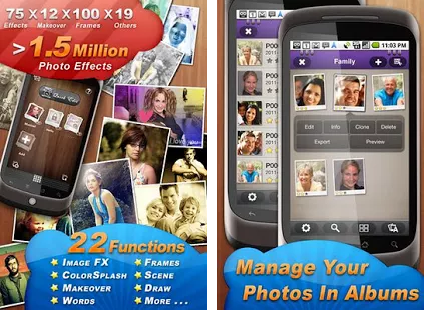 Overall, you wouldn’t one bit feel disappointed by its efficacy in terms of editing your snaps in a jiffy. Google banks high on its own photo editor app, Snapseed to address the burning issues faced by most newbies as well as professionals looking for a reliable Android photo editor. 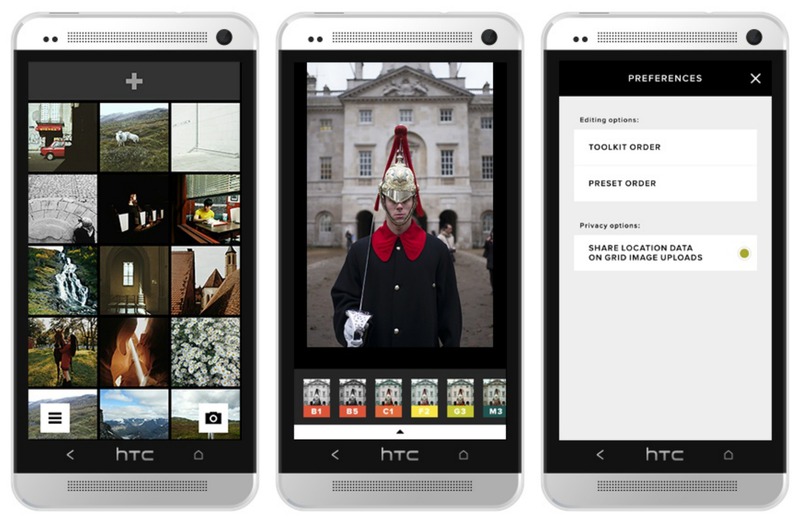 With a couple of taps, you can crop or rotate an image, change background, add filters, add text inlays, etc. in a jiffy. Especially, if you want to add some cool text, you can select from a large swathe of fonts and styles, and Snapseed arranges everything else for you. 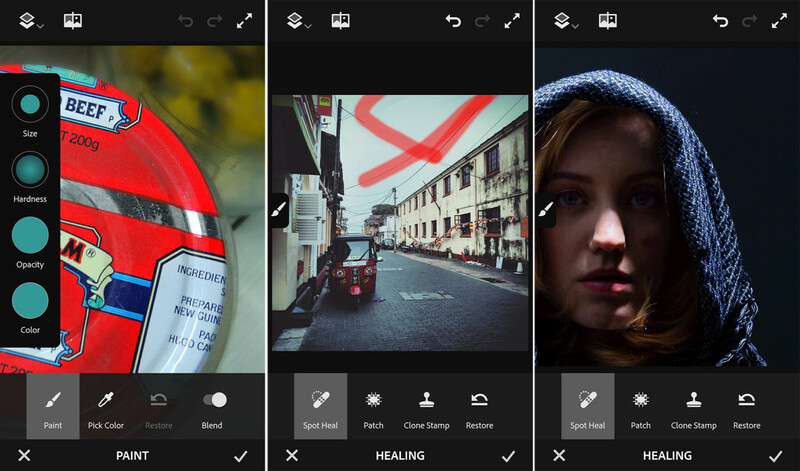 What else injects Snapseed into our list of the best free photo editor apps? 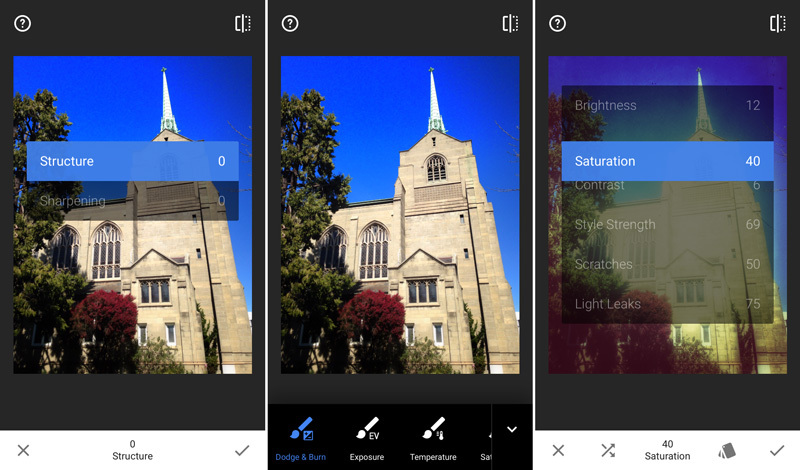 Snapseed boasts a powerful curves tool and is entirely non-destructive in its editing approach i.e. you can view and adjust previous edits. Not to mention, almost all its filters can be fine-tuned and tweaked, as can text placement. In short, some of these features are pro-grade, which is quite astonishing since Snapseed is a free app. 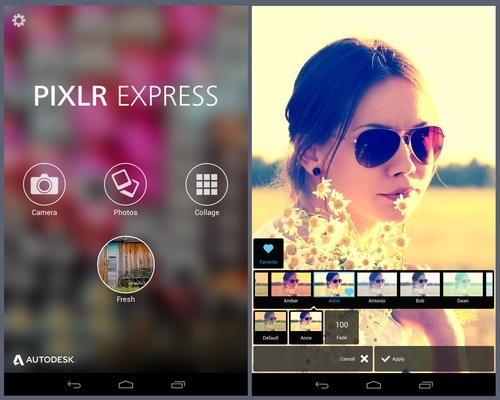 Pixlr Express is a behemoth that can handle heavy-duty photo editing tasks with ease and grace. No matter if its overlaying multiple images on top of each other, or adjusting their opacity and size, it can do it all quickly. In fact, Pixlr Express packs a gamut of adjustment tools such as poster, watercolor, unicolor, vintage, pencil, silk, or cross effects with the option of cropping and rotating an image. The novelty factor for Pixlr is that you can carry out all the pro-level editing tasks akin to a full-blown desktop image editing software which supports layers and share your images on social media sites online. For instance, you can apply an auto-fix, change background, adjust contrast, and tweak saturation, sharpen, blur, smooth, hue, and lightness settings. Moreover, you can add tons of borders from categories such as ripped paper, rounded corner, squared, nature, film and grunge. So much so, you can even add dozens of stickers and choose from plenty of font types on Pixlr. With one-tap manipulations that are perfect for portraits, and scenic images, Aviary packs a great semblance of tools for enhancing your picture. It allows you to manually adjust the colors by tweaking saturation, contrast, warmth, brightness and sharpness levels. Of course, it can also automatically adjust the colours to best fit the type of picture you select. Moreover, Aviary provides a ton of stickers/effects/filters, and allows you to — crop an image, change background, adjust an image’s orientation, and define a focal point to blur the background. 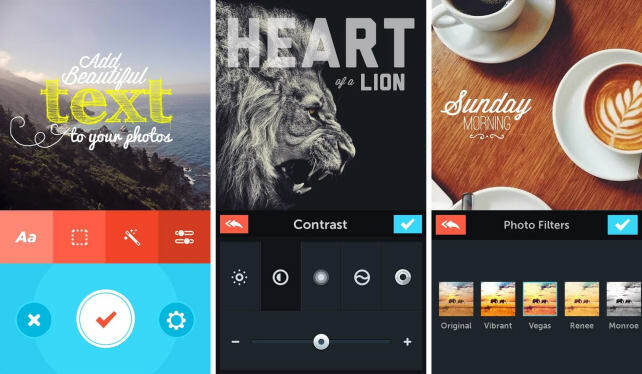 What else Aviary into our lineup of the best free photo editor apps? Aviary also boasts a red eye remover, teeth whitener, font tool, blur tool, blemish remover, colour splash tool, brush tool, and most importantly, a crafty Meme creator with online and social media integration! Another great photo editing app, piZap can not only edit images on your device, but also tweak them on your Facebook account online. 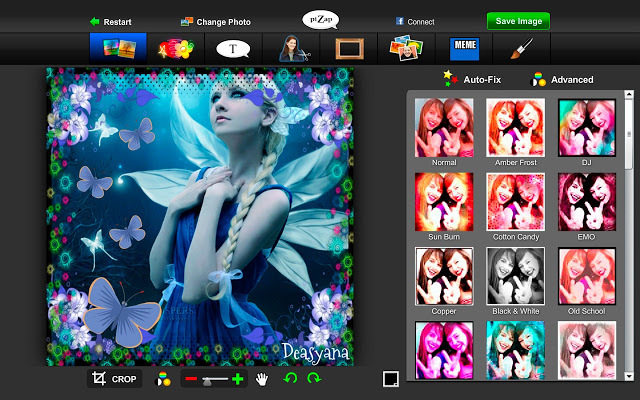 piZap is quite similar to full-fledged desktop photo editing software, in the sense that it supports layering of images so that you can overlay more photos on the original as well as move stickers in front or behind of other snaps. Of course, you can carry out all the basic photo editing tasks such as cropping an image, adding effects, texts, stickers as well as add borders and even remove or change the background from photos. Furthermore, there is a nifty meme maker and brush tool that allows you to paint any colour on your image with four distinct brush sizes. 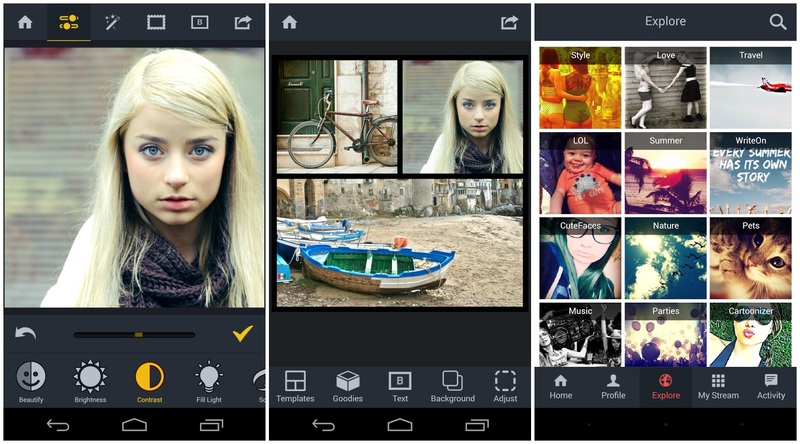 BeFunky has been a staple of photo editing lovers on mobile. Yes, it boasts everything one would seek in a basic photo editing software such as rotating, cropping, or straightening an image. Not to mention, you can also adjust contrast, hue, brightness, exposure, temperature, fill light, saturation, and soften amongst other settings. BeFunky also comes loaded with a text tool and can apply borders to an image. However, the novelty factor that makes BeFunky one of the best free photo editor apps is that it comes loaded with some handy features and effects such as eye colour changer, red-eye remover, lipstick applier, teeth whitener tool and wrinkle remover. 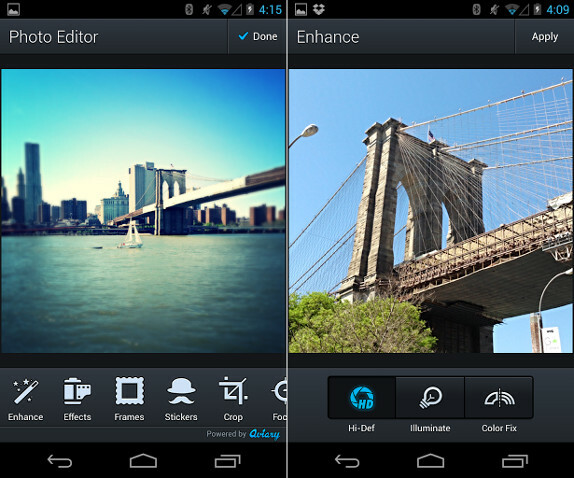 If you are on the lookout for a basic image editing software on your smartphone, then PicLab fits your bill. It has many tricks up its sleeve that cannot be overlooked. Yes, it does offer scaling and cropping the photo, but it is capable of doing a lot more. We are talking about features such as zooming up to the picture to reveal no background, and over 40 background textures and colors. It also boasts over 20 instant effects that can be applied to the picture as well as loads of patterns, borders, and light effects. A unique entrant on our list of the best free photo editor apps, VSCO Cam can store all your edited pics together within the app for easy access, thus saving you the effort of searching through various folders on your device for images. Apart from a range of effects, it also sports some basic editing fixes that you can apply to your snaps such as contrast and saturation adjuster, coloured tint, shadows and highlights as well as all the basic size and colour manipulation tools. PicsArt is renowned for its online social media integration as it allows importing images from your Dropbox, Flickr, Google Plus, and Facebook account. In fact, one feature that makes PicsArt stand out from its competitors on our list of the best free photo editor apps is that you can zoom in on an image regardless of any tool that you are using, which is quite helpful. We are talking about tools such as enhance, crop, stretch, clone, curves, etc. all of which are listed at the bottom of the screen. Moreover, you can fiddle with effects, lens flare tools, change background, texture/border/light/artistic masks and drawing tools, which can be found along the menu bar. Not to mention, PicsArt provides a slick text tool that provides dozens of fonts as well as plenty of free clip art you can add to your image. Additionally, PicsArt allows you to directly export your pics online to websites such as DeviantArt, Tumblr, and Instagram. Rounding off our lineup of the best free photo editor apps for PC is Fotolr which houses basic image editing tools aplenty including the likes of a scene tool, color splash, frame, crop, brightness rotate, brightness, and portrait tools such as lip gloss, and blush. There are many add-ons too that can be used as accessories on your image such as teeth whitener tool, wigs and a hair colour changer. Moreover, you can even share your edited snaps in 10 different ways online over email, Twitter, Flickr, Tumblr and Facebook. And…that’s a wrap! 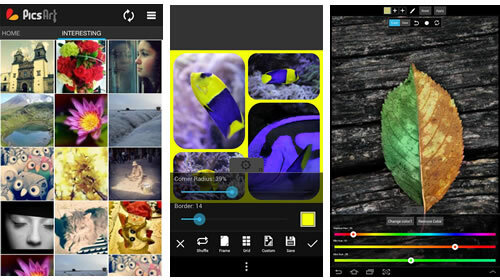 So, did you like our roundup of the best free photo editor apps? Did we miss out on any online app that you know of? Sound off in the comments and don’t forget to download these beauties.